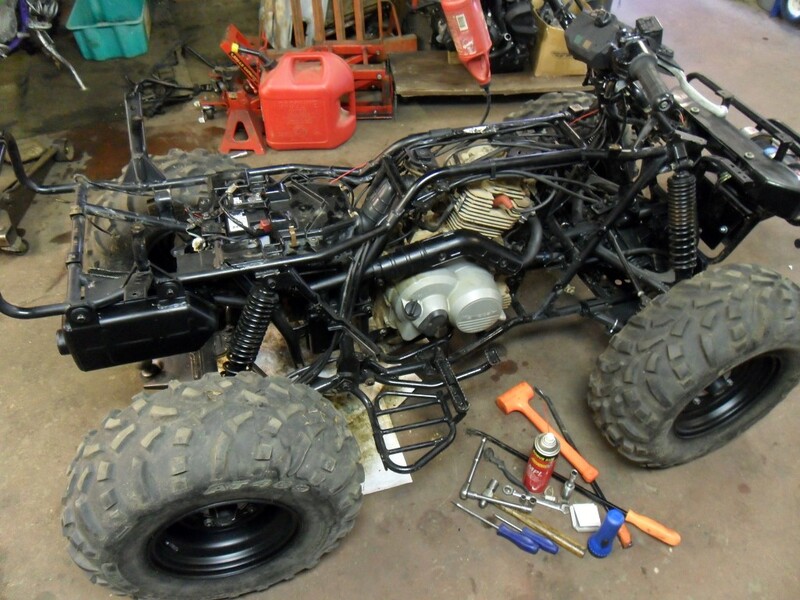 These days, I rarely have time for a ground up ATV project, but that’s what this turned into. I bought this Kawasaki Bayou 300 4×4 a few years ago. 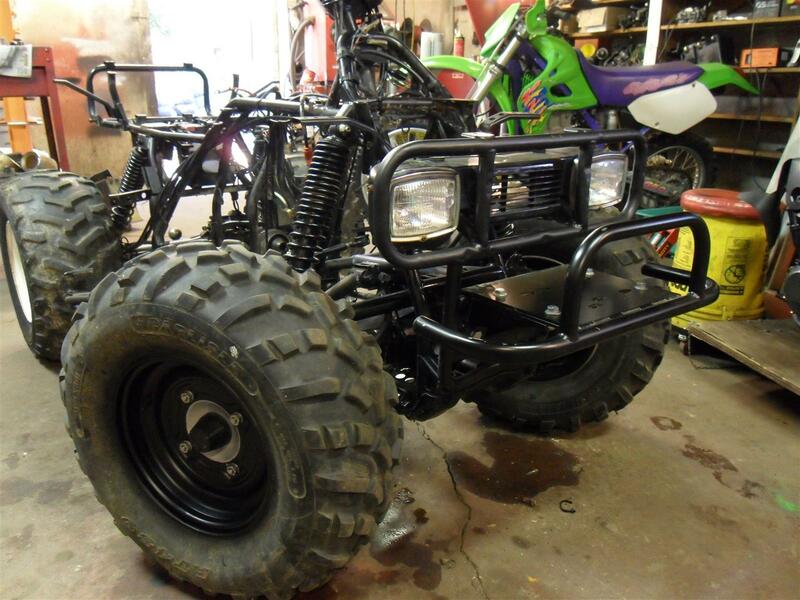 Like the Moto-4 project, I had initially planned to part it out, but after closer inspection, and seeing the decline in the parts market for Bayou 300 parts, I determined that this one may be good enough to fix and keep it as a whole unit. 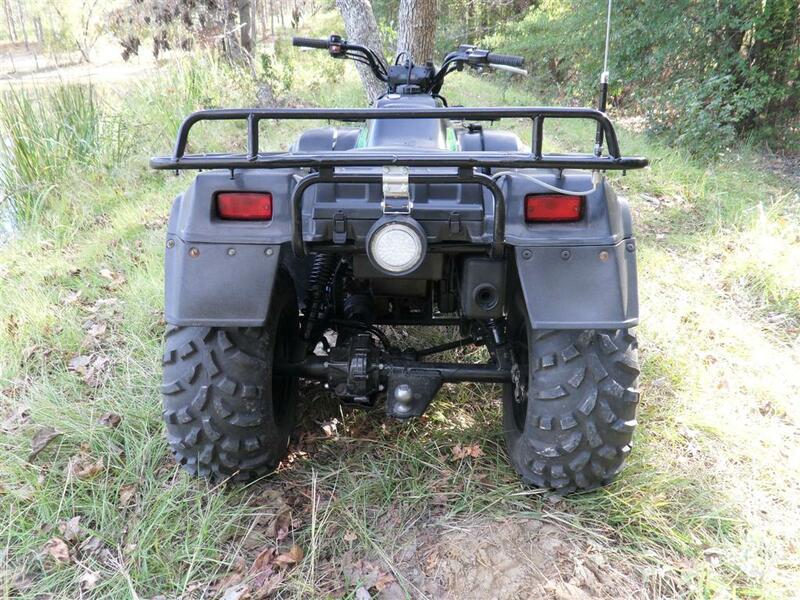 Besides, it’s always nice to have a spare four wheeler around. I could use it if I needed it, or I could sell it. Not as in-depth of a blog post as the Moto-4, but moderately informative nonetheless. Overall, the quad looked pretty sound, but the one thing I knew about it was that it didn’t fire. From my experience, the Bayou 300’s are notorious for eating CDI units, so I guesstimated that was the problem. I rolled it behind the shop intending to get it running within a couple of months or so. Four years later: Well, I finally found time to address the Bayou 300. I found it out back in the bushes as you see it below. So I rolled it up into the shop to pick up where I left off: the CDI. I’ll note that one thing that made this project feasible was the amount of parts that I had in stock for these quads. 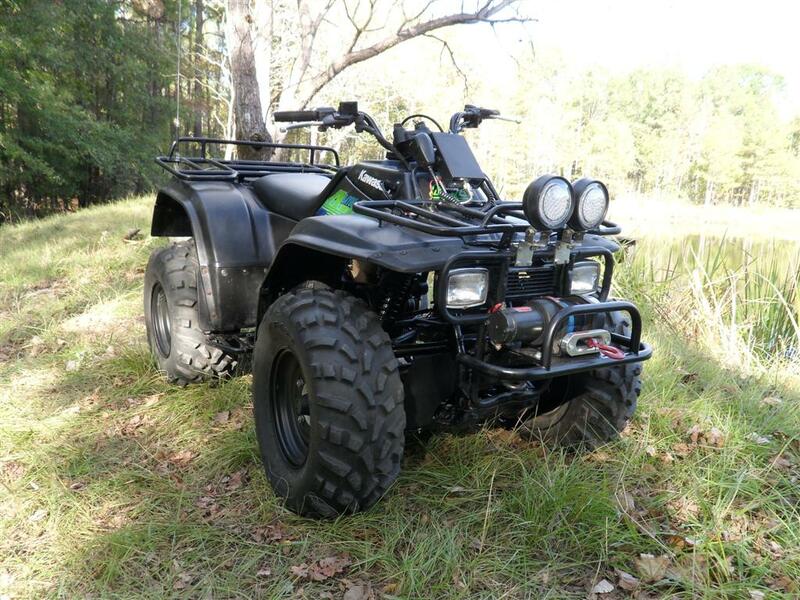 I parted out over 15 Bayou 300 4×4’s around the time period of owning this one. So when I ran across a part in my inventory that I thought I might need for this ATV, I set it aside. One such part was a CDI unit. So once I changed out the CDI, the firing problem was solved; it had a good, blue spark. After that, it was just a matter of cleaning the carburetor and putting some new fuel in it and it started right up. The good news is it runs, the bad news is the cam chain is sloppy and it smokes. Fortunately, I have another engine for parts, and I have a new set of piston rings on the shelf. I replaced the cam chain parts, reworked the cylinder head, honed the cylinder, and installed new piston rings. While I had it down this far, I decided to go ahead and inspect/service the chassis. I removed the plastics and began on the front end. I noticed the front differential axle seals were leaking. If oil is leaking out, then water can leak in, so I replaced the front axle seals. While doing that, I noticed the front drive shaft u-joints had slack (a common problem on these, due to the joints being so small and light-duty) so I replaced them. Next, I noticed the front brake calipers were frozen, so I replaced them with a couple of used ones I had on the shelf. While on the front end, I decided to address the potential for mounting a winch. 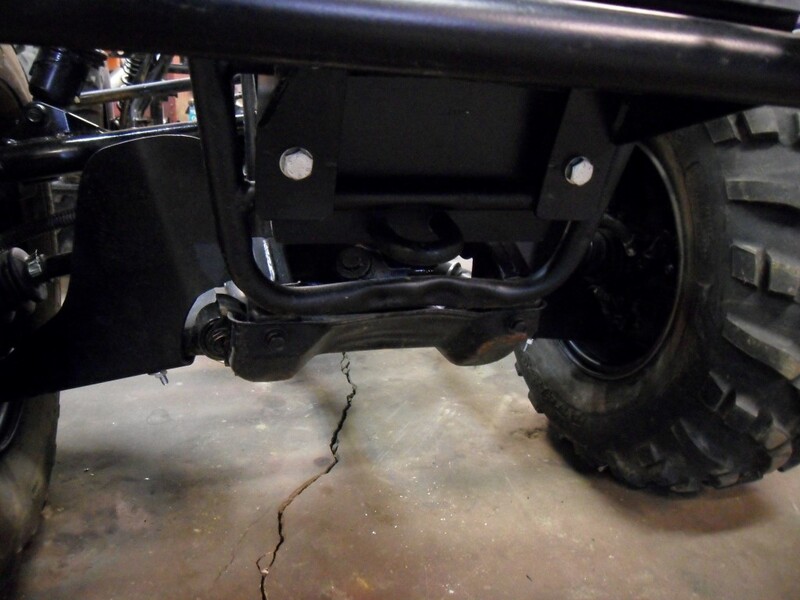 I located an aftermarket winch bumper at a local ATV shop. 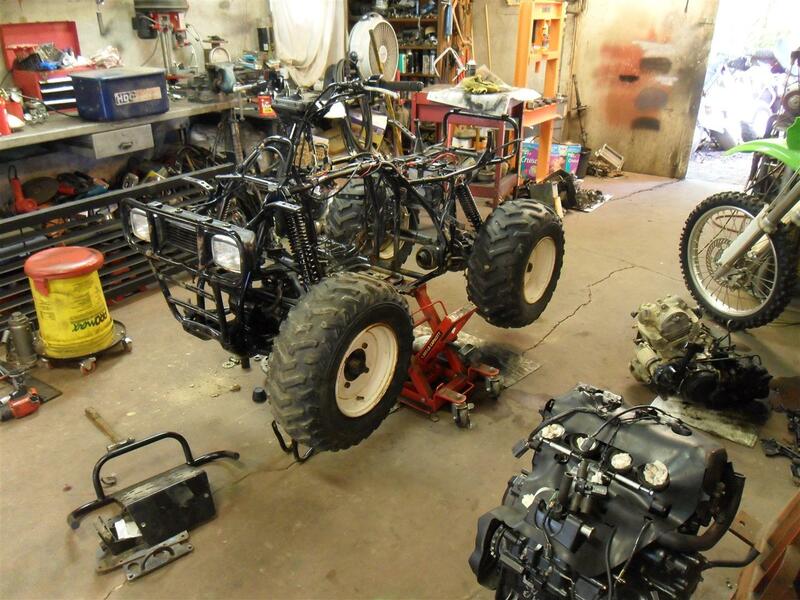 It will be an easy winch mounting solution, after all, a utility ATV is not fit for use without some type of recovery instrument. I also had recently bought a Bayou 300 parts quad with a fairly new set of Carlisle AT 489 tires, so after I painted the front part of the chassis and the front hubs, I painted the rims and installed the replacement wheels and the winch bumper. I had a Warn 2000 lb winch on the shelf from a previous part-out. It worked great but needed a new cable. While cable shopping, I saw a synthetic winch rope that advertised twice the strength of steel cable, so I decided to give it a shot. The advantages of the rope is that it is light-weight, easy on your hands, it floats on water, is highly visible, and is supposedly exponentially stronger than steel cable. The down side is that it can be cut easily which is why it comes with a three foot lead of rope-protecting housing at the end of the rope (hook end) so the rope will not be cut when winching from around a tree, etc. I bolted the winch to a universal mounting plate with provisions for a fairlead, then to the bumper. It’s important to note when using a synthetic winch rope, it is generally recommended to use a hawse style fairlead. That’s the smooth metal one shown below, as opposed to a roller fairlead commonly used with steel winch cable. On to the rear end. 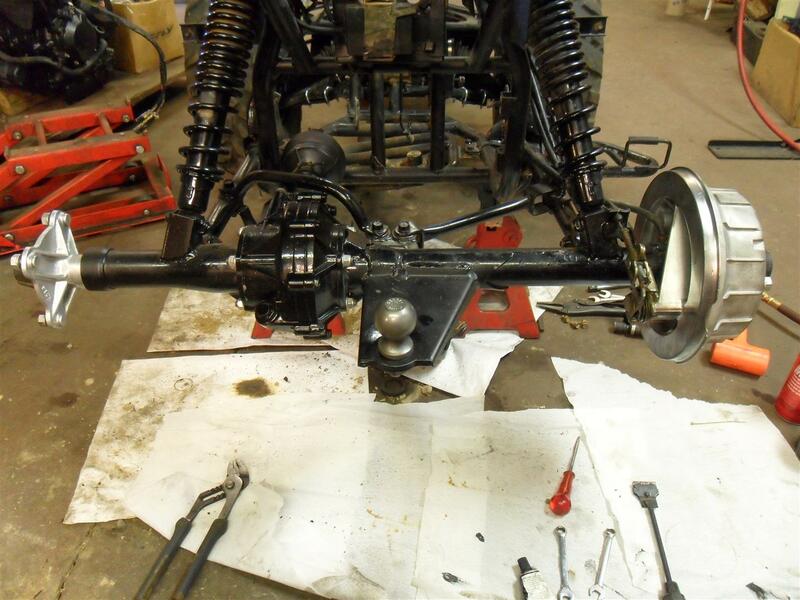 The two things I initially set out to address on the rear was the brake, which on the 4×4 model is located on the right hand side, and the axle bearing and seal on the left hand side. I noticed the left seal was leaking, and generally if the seal is leaking it is because someone ran the hub loose allowing it to move and waller out the seal. Then once the seal fails, it allows dirt into the bearing, and within one ride, the result is bearing slack. 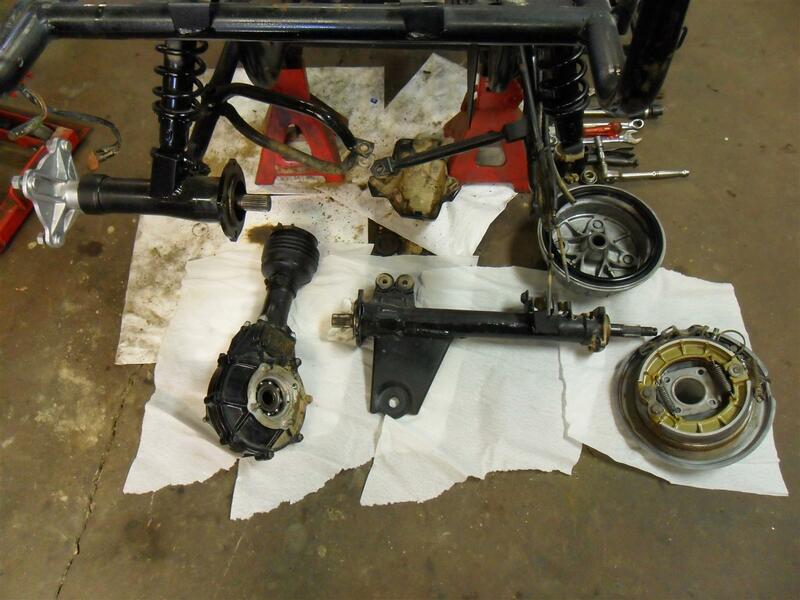 So, as I began to dismantle the rear, I notice a significant amount of greasy mud in the axle housing. Once again, the project snowball continues to roll. I decide it best to dismantle the entire rear end for cleaning and inspection. My inspection of the rear actually brings some pretty good news. Despite the mud, it all looked pretty good. 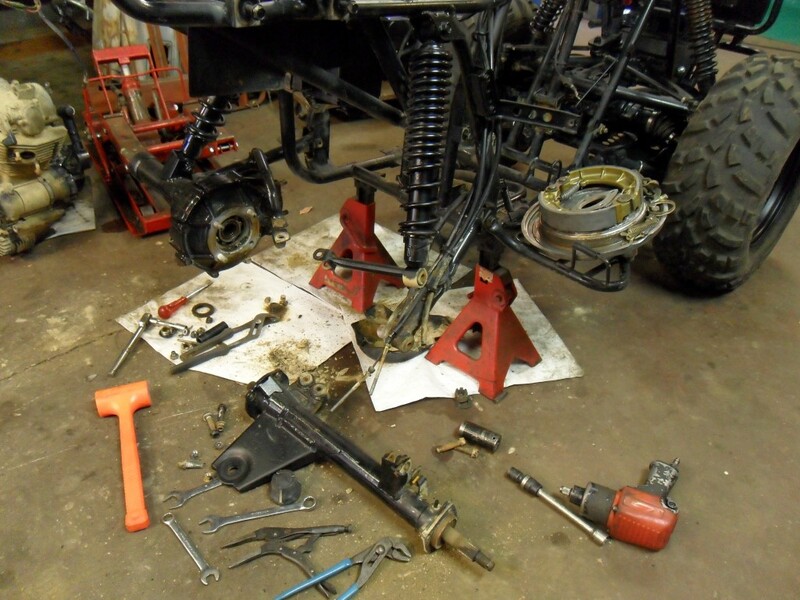 The axle splines were in good shape, the differential was good and tight, and last but most certainly not least, the rear drive shaft was actually in good shape (which is rarely the case on any Bayou ATV). So after lots of cleaning, blasting, polishing, and a little paint, I laid out all the parts and threw it all back together. So now it’s time to stab the engine and install the exhaust, carburetor, intake, etc. This all went pretty smooth. I was then able to grab my makeshift iv bottle and a hot battery and see if this thing was going to run. Of course it did, so now we can bolt this thing up, get the fenders on, and start on the accessories. For fenders, it had a pretty good set to start with. However, someone had gone wild with an automotive paint gun and clear coated them. This of course is never a good idea because the fenders flex, the clear coat bubbles and flakes off, and you are left with a dull set of fenders with sanding scratches all over them. I had another black set from a previous tear down, and while the graphics were decidedly less flashy, I used those. When the fenders were on, I could install the rest of the winch wiring, my auxiliary lights, and my batteries…yes, plural. 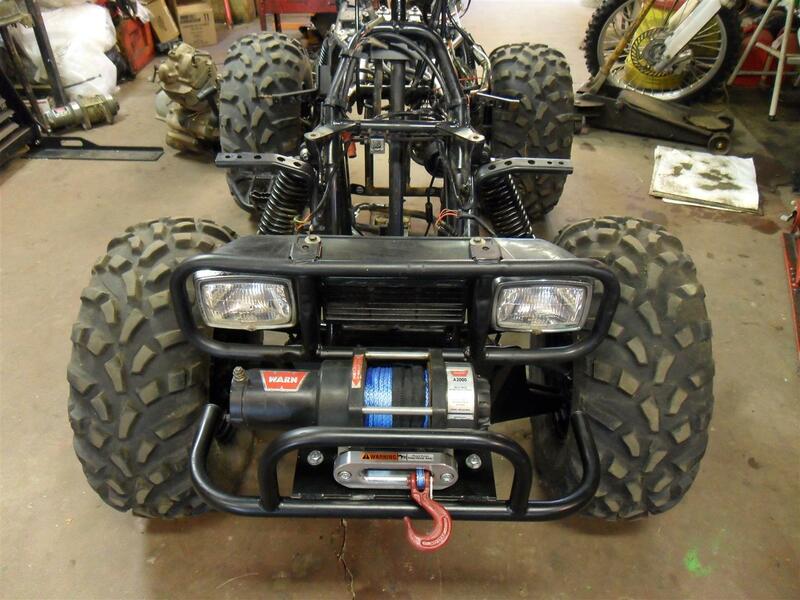 I’ve always wanted, and often needed, a dual battery setup on my ATVs. With all the winching, lighting, and miscellaneous electronic equipment, I sometimes find myself with a low battery on a long night ride. Also, when I go a couple months without starting the ATV, I find the slightly low battery makes for a difficult start. I can’t help but wonder if having two batteries would solve this…so I give it a shot. It just so happens that the Bayou 300 is a perfect candidate for it. 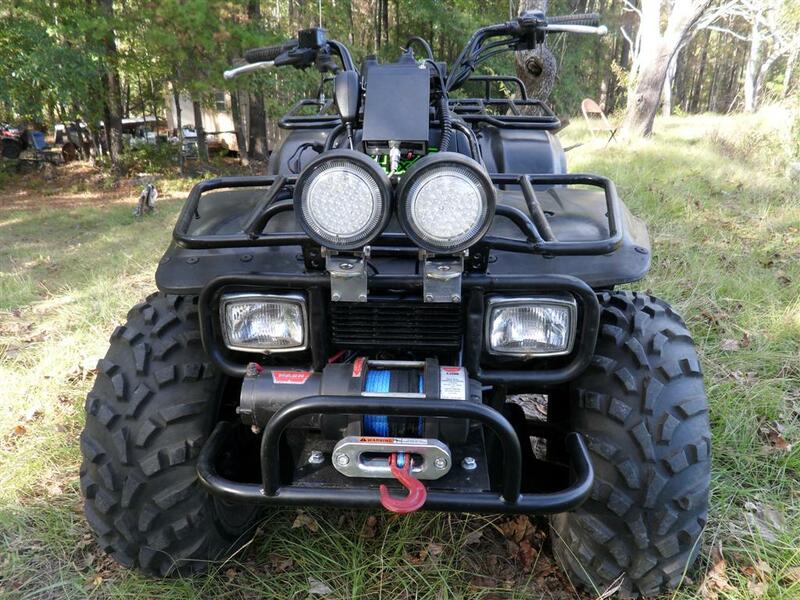 It has the normal battery mount under the seat, and a dry storage box in the rear fender behind the seat that is the perfect size for another battery, and in this case, the winch solenoid. Below is a pic of the two batteries installed, along with the scores of wires needed for all my accessories. 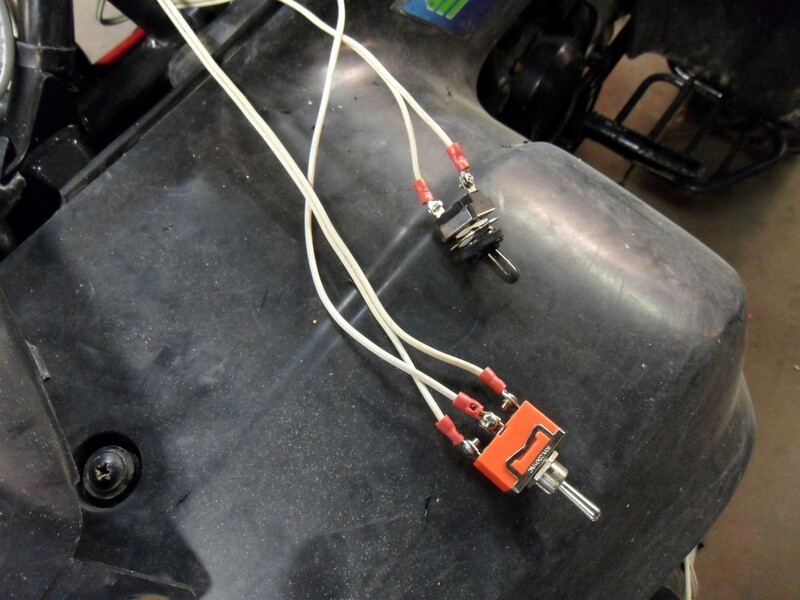 To finish up the wiring for the winch, I use a momentary 3-way toggle switch mounted on the upper left side of the gas tank below the handle bars. I also place a toggle for the rear LED light I will be mounting on the back of the ATV. Now, if you’ve bought a toggle switch at a part store lately, I’m sure you’ve noticed the sub par quality of most part store toggle switches. This is why I will never buy one again; they are total junk. 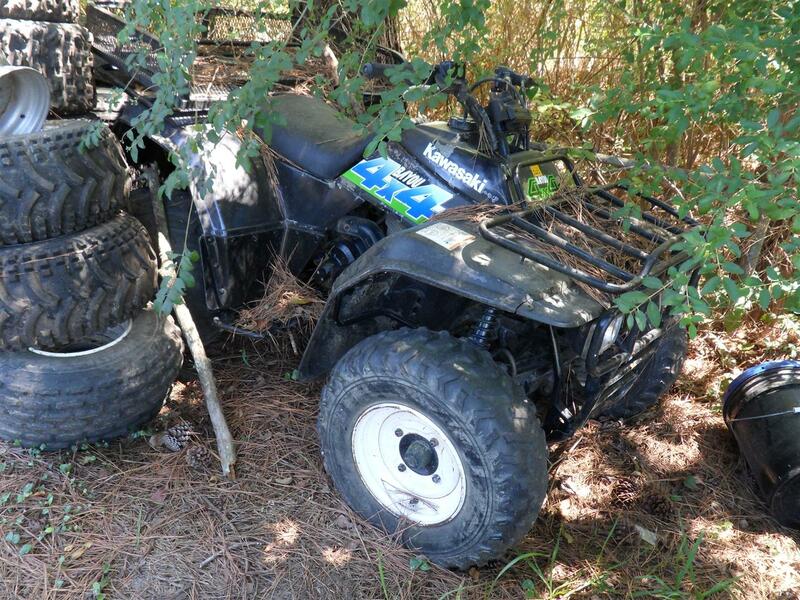 If they can’t hold up to interior use on a vehicle, they most assuredly will not hold up to exterior use on an ATV. For most of my switches, I turn to Del City. Friendly service and great stuff. Anyway, below you see the two toggles, one with the weatherproof rubber boot which works great for ATV applications. So once the internal wiring is completed, I install my accessories. I use two LED flood lights up front wired directly into the headlight harness. 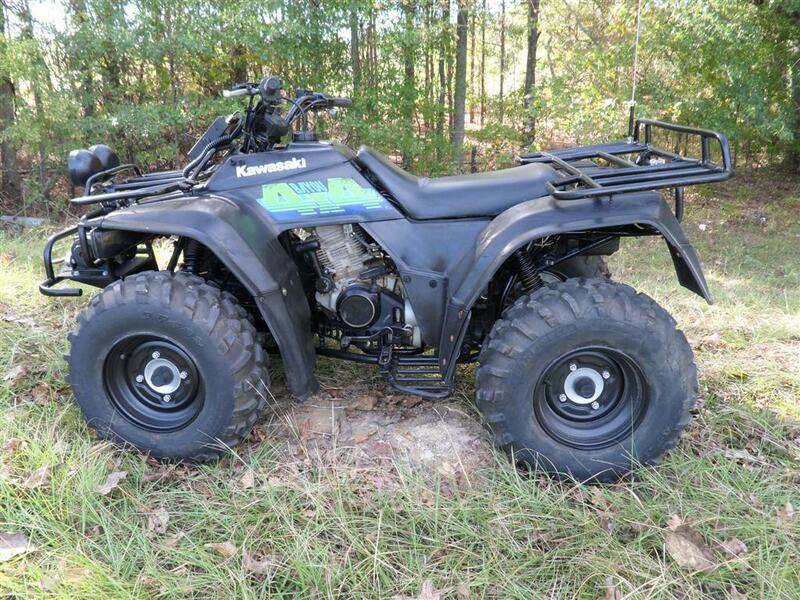 The Bayou 300 4×4 has provisions for a lot of Genuine Kawasaki upgrades. One such upgrade offered at dealers was a handlebar mounted headlight similar to that on the 2×4 model. 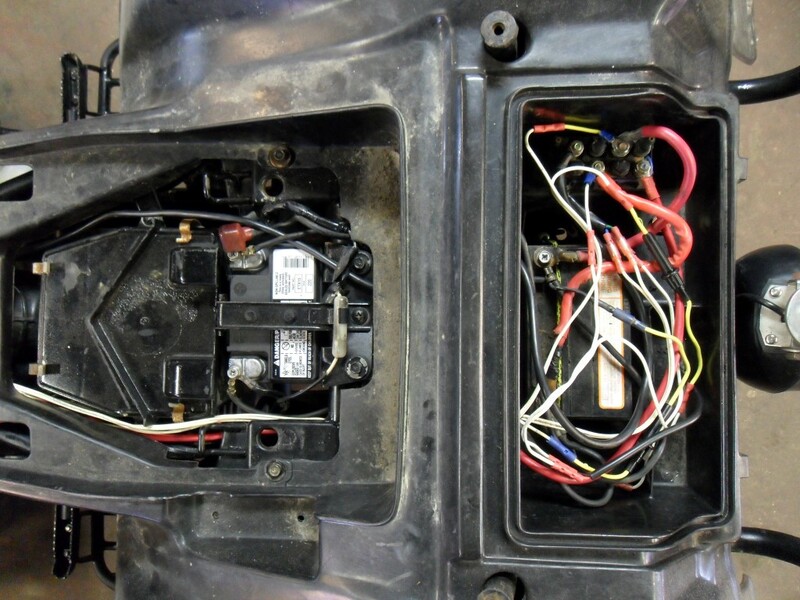 For wiring, there is a set of bullet connectors on the headlight harness under the front fender. These tie into the headlight switch on high beam only. So these are what I used to wire in my flood lights. Also, I installed a 12v power port on the upper right side of the gas tank under the handlebars. I mounted it flush in the fender bezel. This is the power supply I use for the CB radio that I mounted on the front rack in front of the handlebars. It also works great for recharging cell phones and digital cameras on the trails. For the CB Radio, I go with the simple Cobra 19 Ultra III. 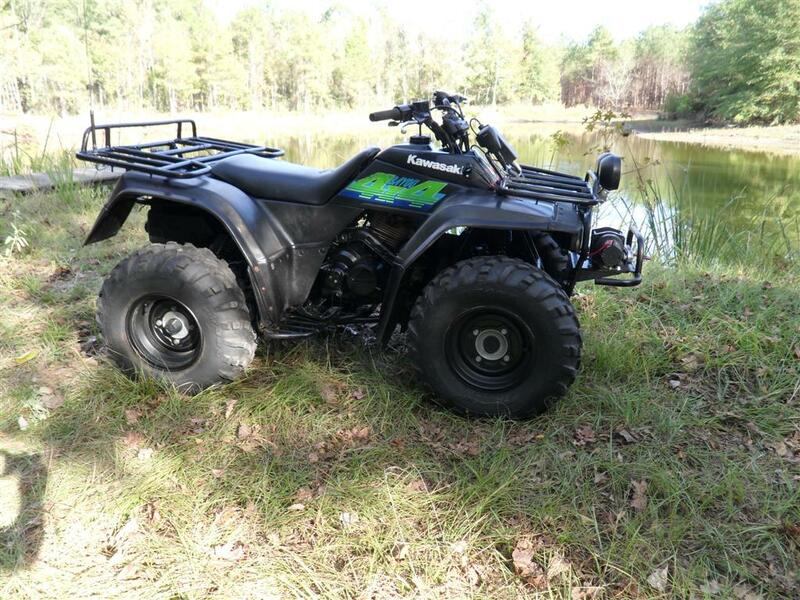 As I’ve stated before, you don’t want an expensive radio on an ATV where it is susceptible to weather and theft. Besides, the 19 Ultra III actually talks pretty well. For the antenna, I use the same type of 64 inch steel whip bottom loader that I use on everything. It seems to do well. I use a short coax and mount it to the rear rack. And at last, possibly the most useful accessory on a night ride, the rear backup light. For this I use an LED flood purchased at Northern Tool. Now for the pics! 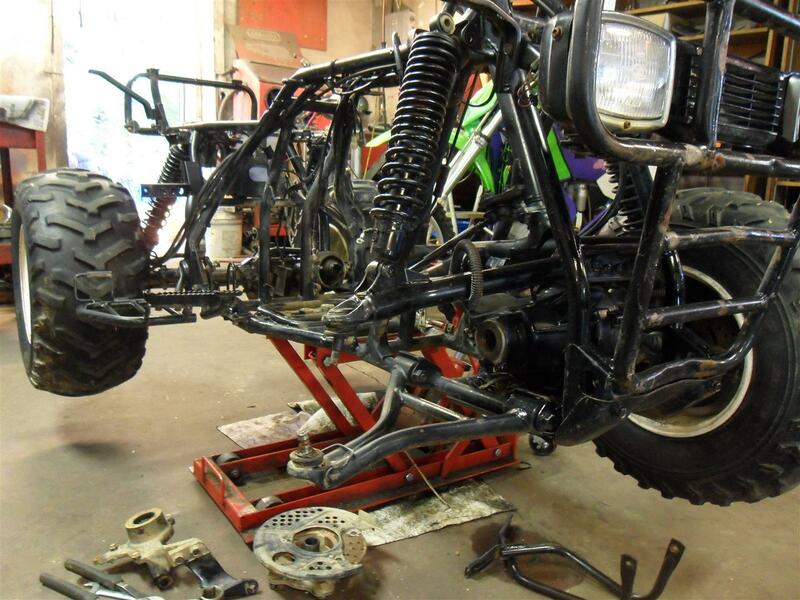 So that pretty much wraps up another long, drawn out ordeal of an ATV project…or does it? I feel an update coming on. What year is your Bayou? That’s a good question. I’m not certain, which is why I omitted the year model from the post. Bayou’s changed very little over the years, so the best way to tell the year is from the VIN. However, it’s hard to make out the VIN on this one because the frame was rusted and then painted at some point before I got it. I could see enough of the 10th VIN character to believe it is a 1991 model chassis. The fenders and engine I used came from a 2000 model. 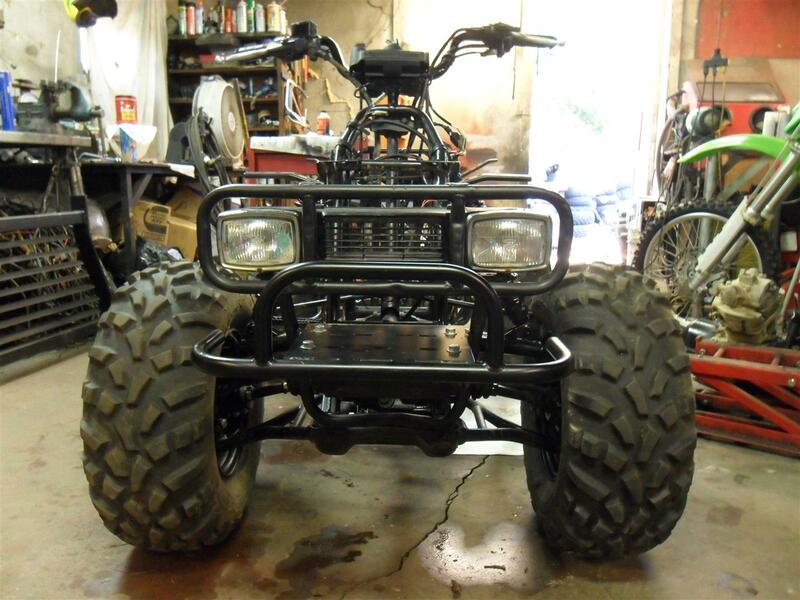 I’m not sure about the chassis…I think maybe 1991 or so. The frame had been rusted and then painted so I couldn’t quite read the 10th VIN character to get the year. The parts I used came from many different year models. Good job wish I knew enough to hear mine down how to separate rear output shaft to pull motor out? Good job wish I knew enough to tear mine down how to separate rear output shaft to pull motor out? The rear drive shaft is splined onto the output shaft of the engine. It slides right off. Can you tell me what brand the front winch bumper/mount is?? want one for mind but dont know where to look??? Thanks!! I wondered this myself…I thought it was a pretty nice bumper. I don’t know the brand. It was in some surplus inventory I picked up at an ATV shop. It wasn’t in a box and didn’t have a tag. You’re probably on the right track by putting the joint in without caps and then installing them. It’s been a long time…I really don’t remember how I negotiated it.